Submitted by lynn on Monday, May 16, 2016 - 11:59am. Lisa and Dennis have birthdays in the same month and we typically pick a date in the middle to celebrate. This year I suggested Pomegranate for some Georgian/Russian food. 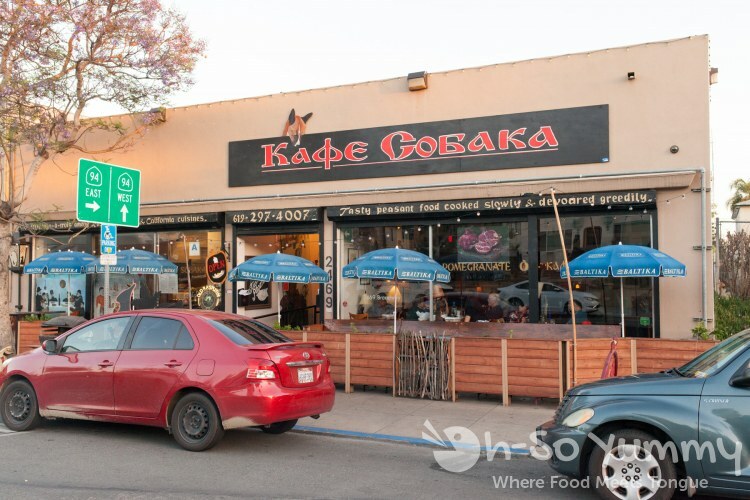 First off, it's important to note there are TWO restaurants referenced as "Pomegranate," this one (Kafe Sobaka Restoran Pomegranate) in Golden Hill and the original Pomegranate in North Park. I found this out the hard way when a girlfriend suggested meeting at Pomegranate and they were actually at the Kafe Sobaka location instead! For this visit, I made sure to tell the family which street the restaurant was on! Pomegranate started on El Cajon Blvd in the North Park area but the owners sold that location and they opened Kafe Sobaka in Golden Hill. Interesting enough, both restaurants still serve the same delicious dishes but the GH location is open for both lunch and dinner. Be aware that the phone numbers listed on google/yelp are only ONE number different! Make sure you know which place you are trying to go to! 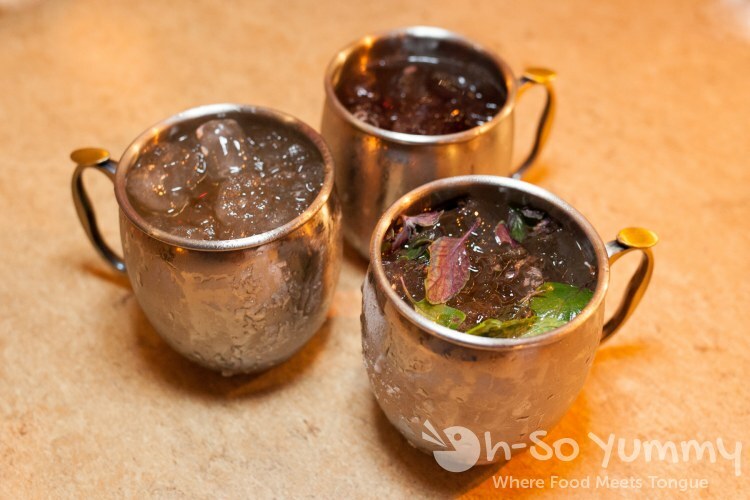 Our happy birthday folks decided to start out with some mules to drink. 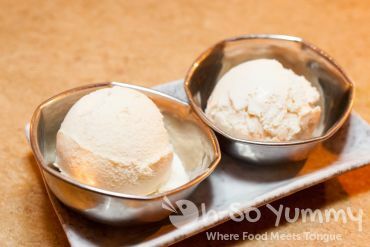 There were three different variations you could order: herbal, spicy or sweet. Herbal was essentially mint flavor, the spicy one provided a stronger ginger bite and the sweet was a bit on the syrupy side. 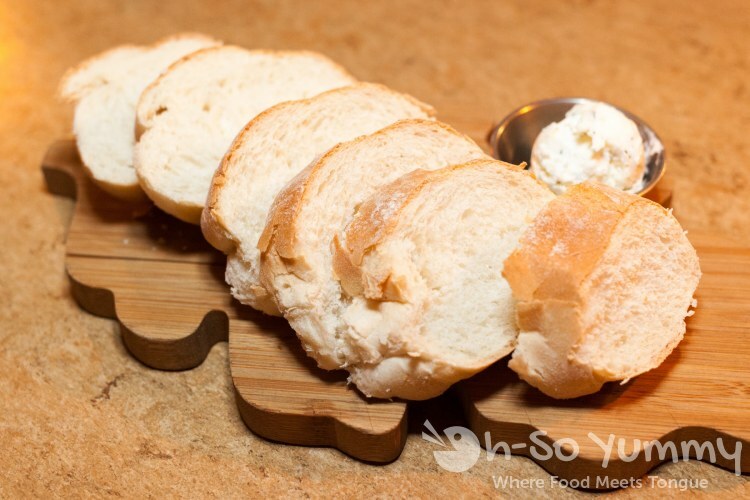 As an appetizer, we were served two platters of soft crusted fluffy bread with a side of chilled garlic butter. When asked if we wanted to try their cheesy bread, we thought why not? It was quite large too, perhaps 8 inches in diameter, and reminded us of the pupusas we had at Cuscatlan Salvadorian Cuisine last year. 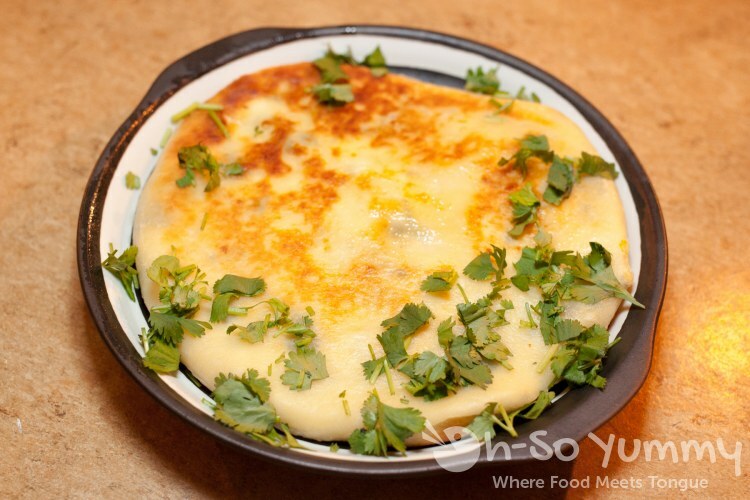 The ratio of cheese to crust was perfect - a feta and mozzarella mix surrounded by a thicker buttery flaky crust. 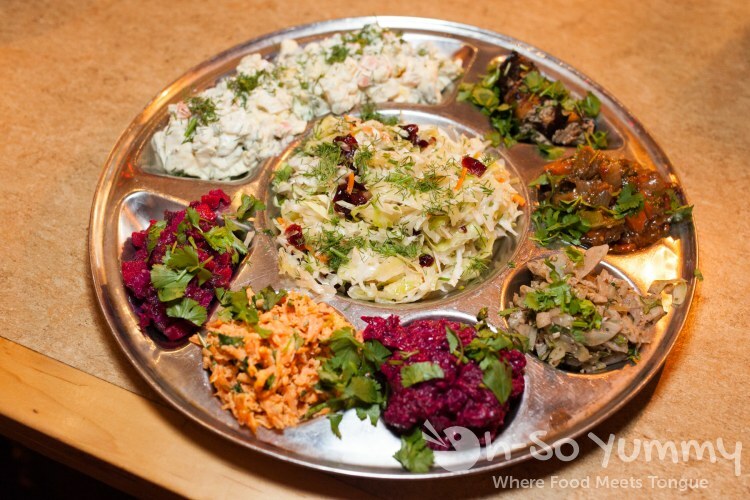 Zakuski sampler platter - For those who left their GPS in the car, allow our wait staff to orient you to the possibilities. The appetizer platter was filled with cold salads and pasta salads, with plenty to share amongst family. It would also make for a good vegetarian platter too. In the middle was a very cole-slaw type food. Going counter-clockwise, the top left sampler was a type of potato salad with dill and light mayo. Below it were red beets that just melted in your mouth, some shredded carrot with a little bit of heat and more beets that were spiced rather than sweet. The neutral colored item on the bottom right was a bit pickled, followed by chilled eggplant with the normal taste and texture. The last item was supposed to have the most heat but this pate-like item turned out to be one of my favorites and wasn't spicy to me. The beef tongue was cut into thicker steaks. Slightly fried on the outside, these had a crispy texture against the fattier and softer interior. The smaller vinegary red sauce was slightly mealy but added a nice acidity to the meat. The second item was more of the pickled and spicy beet. Both items were the same items from the sampler earlier. The stewed chicken felt a bit stringy and sucked of moisture even when sitting in a pool of drippings. The fluffy rice was a mellow broth flavor. I was quite underwhelmed by this dish, especially after sampling multiple dishes prior. Now THIS was finger-licking good chicken. So plump and savory and I wanted it all. The server asks if you want pomegranate sauce which is where the dark sauce squiggles come into play. On the side were a few vegetables that were overshadowed by the glorious main entree. I had this on my last visit and knew I had to order it again. The combo of cabbage surrounding seasoned beef with aromatic chunky red sauce sends my senses to heaven. Dunk in sour cream if that's how you like it. There's rice on the side to make it a complete meal. I have a quickie recipe at home using canned cream of mushroom but nothing beats the real thing. 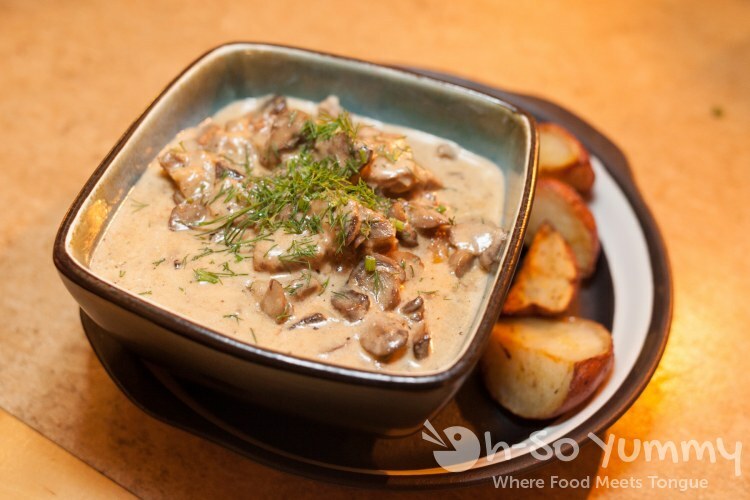 The Stroganov sauce has a rich mushroom creaminess: the majority of our party thought the flavor was point on while one thought it was a little too creamy. There were plenty of mushrooms on top but it still could have used a tiny bit more content. I am wary about stew meat since it can easily be overcooked but this one seemed fine. 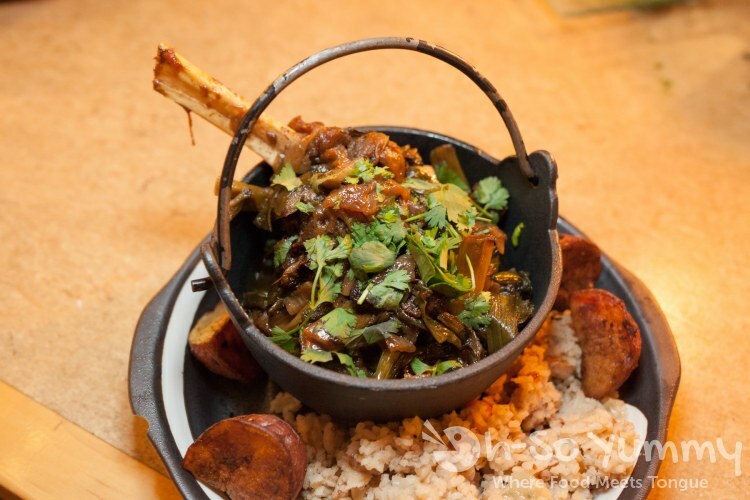 This entree was a special of the night and comes with rice and potatoes and huge piece of lamb in its own container. Dennis started shredding it to make it easier to share and noted that it fell off the bone easily. Some portions of meat were fatty and more tender than others but sis-in-law mentioned it was quite gamy. The veggies were soaking underneath the meat in its rich fatty meat juices. I think that was what I liked best. This place has multiple ice creams which I believe are all made in house. 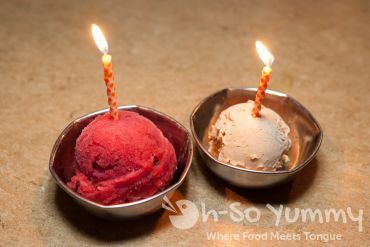 Birthday boy Dennis went with the "chef's experimental" which was sour cherry sorbet. The sorbet was wonderful and we found pieces of sour cherries at the bottom, giving it a different fruit texture. Birthday girl Lisa got the plum wine ice cream which was interesting to say the least.. it didn't have much taste other than a heavy cream feel. Little brother Robin ordered the honey vanilla, a flavor I would have never ordered on my own, but it turned out to be everyone's favorite! It was a creamy flavor without a sticky sweetness... just a great balance overall. The back room ended up being a private setting, especially since the rest of the patrons were in the main dining area. There's no fee to use it and whoever gets there first can request a movie to be played on the screen (a small selection of foreign movies is available). Dennis didn't even know about this secret room even though we've been here before! You enter by passing the hostess stand/kitchen entrance and taking a right! As for service, everyone was friendly and the food came out in a reasonable time. 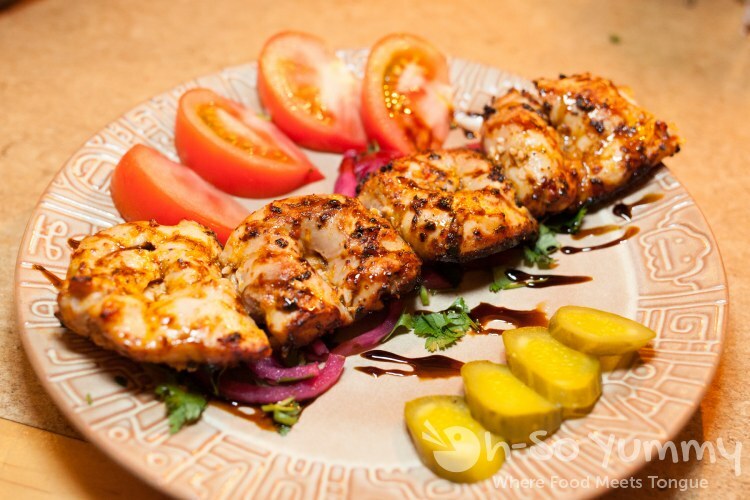 The restaurant location is close to the freeway and parking is easy compared to the busier food areas in San Diego. I can't wait to go back for more delicious eats! you should take maggie here. you can eat the yummy kababs and desserts hehe. I love mule cups. They are the best! The herbs in the herbal one look nice - I think I’d want to try that one. The cheese pie looks like something that’s right up my alley! Yum! I do love the menu descriptions! I’ve read the menu before and yet I still haven’t been here. Silly me. 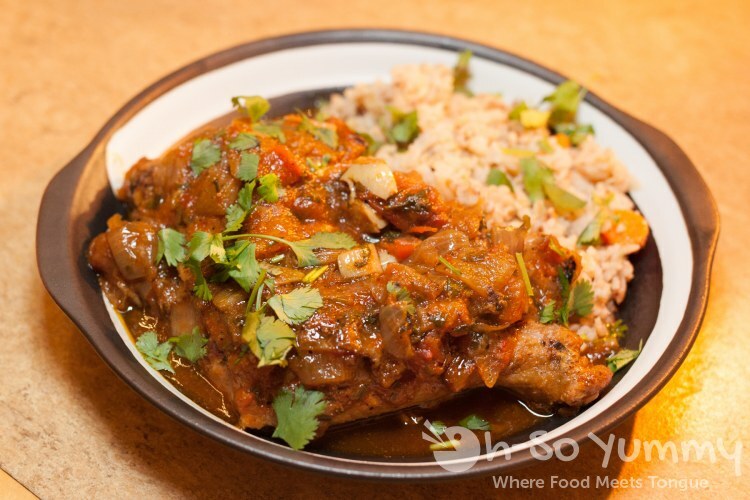 The Chicken Shashlick looks really yummy with the sauce drizzled on it. Looks like you guys were really able to sample a lot of the menu! I have ALWAYS wanted to try Pomegranate! I didn't realize there were two of them so thanks for the tip. That cheese dish looks so good especially with the buttery crust. I would totally order the chicken kabob dish. 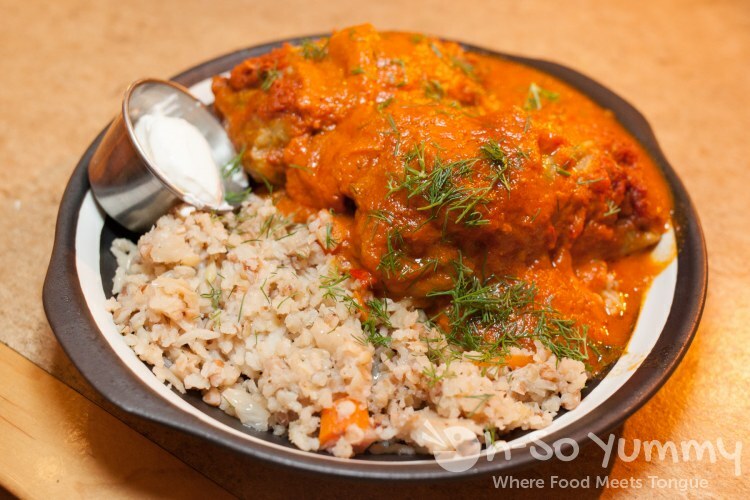 I love your mention of canned mushroom b/c that can of mushrooms made alot of college meals for me (mushroom chicken, mushroom beef, mushroom rice, etc etc). i hope you do visit! i'm still a bit shocked at how much i like the food. it's high on my list right now and doesn't really break the bank. We like this place (their menu descriptions are so funny!). I took my friends here a few years ago for a birthday celebration. 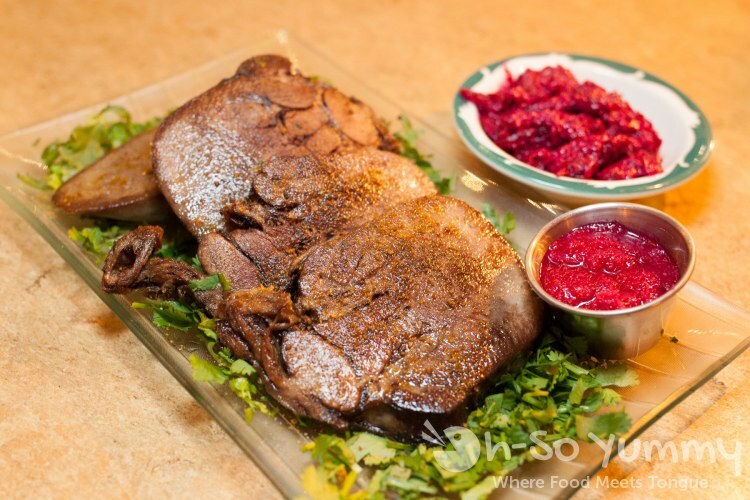 We really enjoyed the salad sampler, the stroganov, the Derevesnkaya Skovorodka (potatoes, onions, mushrooms and herbs fried in duck fat and served in a skillet), the piroshki (savory pies) and the borscht. Wow, how did I even miss this post last year? Lovely photos of the food. You tried a bunch of stuff I hadn't before like the tongue and the stewed chicken. I've eaten here several times before with my family and also some girlfriends and each time, the food was excellent. You can't get bored in this restaurant, from the decor to the interesting and delicious entree and the menu descriptions! there are even more items that i've tried on another visit that isn't even listed here! i thnk some kind of dumpling or potato item? seriously though, this place is one of my favorites! just about everything is great.